Meet Nate Bell, a third generation farmer who has vowed to leave the land better than he received it. 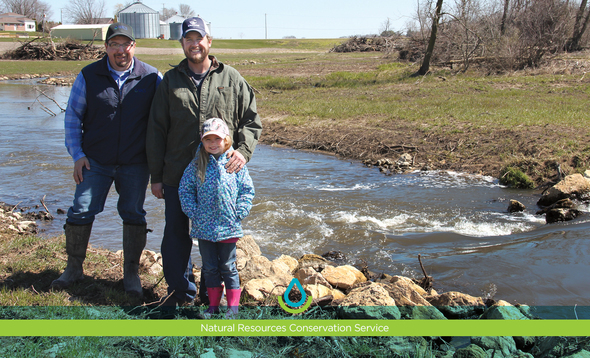 Meet Nate Bell, a third generation farmer who worked with NRCS to restore Little Lemonweir. Streambank erosion was a huge problem for Bell’s operation, and the plugged up streams from the beavers would flood his fields, making things even more complex. Working with NRCS, Bell restored over 1,700 feet of stream using a combination of practices like drainage water management, cover crops and more. After being covered in overgrown woody biomass and invasive species, making it impossible to navigate, NRCS practices have helped the stream support fish and invertebrate life again. Now that the stream is restocked with brown trout, Bell can’t wait to take his family fishing there.